Terrafolk, pods, crowd. Mystica on guitar. Tree in background. Master pyrotechnicians The World Famous return with an astonishing new show featuring live music from Slovenian musicians Terrafolk. Full Circle uses fire, fireworks, music, special effects to tell a story of transience, change, and the relationship between humanity and the environment, taking you on a musical pyrotechnic journey through the seasons. A frozen tree sits in a wintry landscape. The wind howls through its branches, carrying strange sounds. Out of the noise, a tune appears and 4 pod-like flowers slowly open, revealing the musicians. The music gradually brings the garden to life� spring�s new growth blooms into a colourful summer party � then the heat builds and the air turns heavy�. Can the music resist the storm? In Brief: Full circle is a music, light, pyrotechnics and soundscapes show based around the life-cycle of a tree. Summary: The focal point of the show is the large structure of a tree. 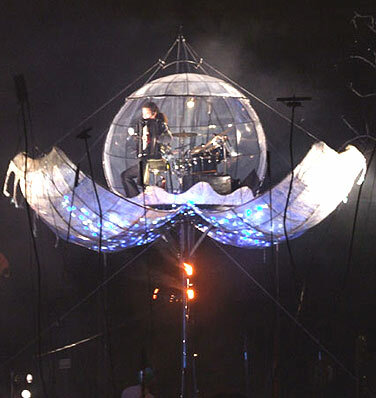 The 4 musicians of Terrafolk perform live inside 4 x 3.5 metre-high �pods�, spaced out in front of the tree close to the audience. Terrafolk play their own compositions live as the tree goes through the seasonal transitions accompanied by all the rich colours and sounds associated with each season. A Quick Run-through: The cycle starts in Winter and all that can be heard is an icy, chilling soundscape as the musicians strum and tune their instruments. Fuses are lit and travel up to each of the 4 pods. The pods open and spring buds start to grow via Green Lance fireworks. Terrafolk perform a Bach composition as Spring erupts everywhere. Spring blossoms with more multi-coloured pyrotechnics on the tree and the pods and the music is now a Terrafolk Gypsy number followed by a Waltz. As summer arrives, the fireworks and lighting become more yellow and golden and Terrafolk perform a more lively drum and bass based piece. A jazz number called "Still Resist the Storm" kicks in as Summer blooms. Then, the atmosphere begins to become eerie and charged as a Summer storm approaches. This storm explodes to the tune of Terrafolk�s metal version of �You Are My Sunshine�. Cue in the most dramatic and spectacular part of the fireworks show. The storm comes to an end, Autumn arrives and the music is peaceful and lulling (a piano composition). Lighting and fireworks are more orange and red in colour. Finally, the tree�s cycle comes full circle back to Winter. The music returns to the Bach piece Terrafolk opened the show with. Winter sets in, the music fades away, the pods close and a fire-drawing of a human form burns inside the tree�.